Reference number for this case: Beg-Oct-54-Thuir. Thank you for including this reference number in any correspondence with me regarding this case. 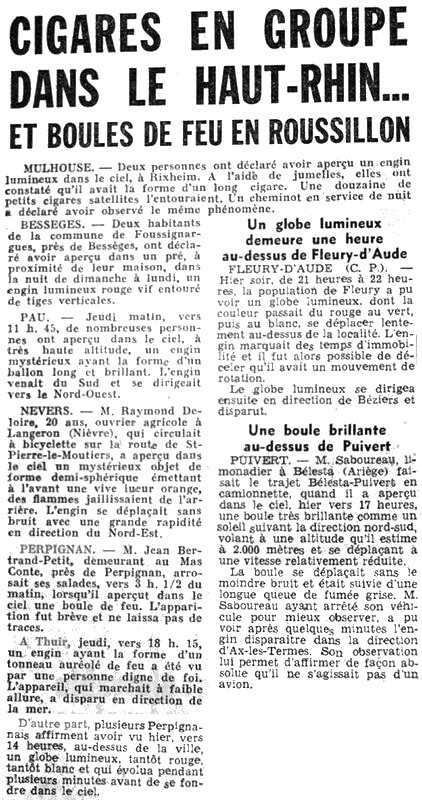 The two authors indicate that in the newspaper "L'Independent de Perpignan" for October 2, 1954, there is a mention of an observation in Thuir, of a machine in the shape of a barrel haloed of fire, observed by a person worthy of faith. The authors do not indicate a date for the observation. They suggest that the explanation of the case is that because in Thuir, wine is produced, which is put in barrels, and just as in Cavaillon people see melons in the air because Cavaillon produces melons, thus in Thuir people see barrels in the sky. The authors then comment that if at a time given this barrel appeared in the form of a sphere then "it is legitimate to think that there was 'ball lightning'". [bb1] "La Grande Peur Martienne", book by Gerard Barthel and Jacques Brucker, Les Nouvelles Editions Rationalistes publishers, France, page 168, 1979. 1.1 Patrick Gross October 24, 2011 Addition [in1].